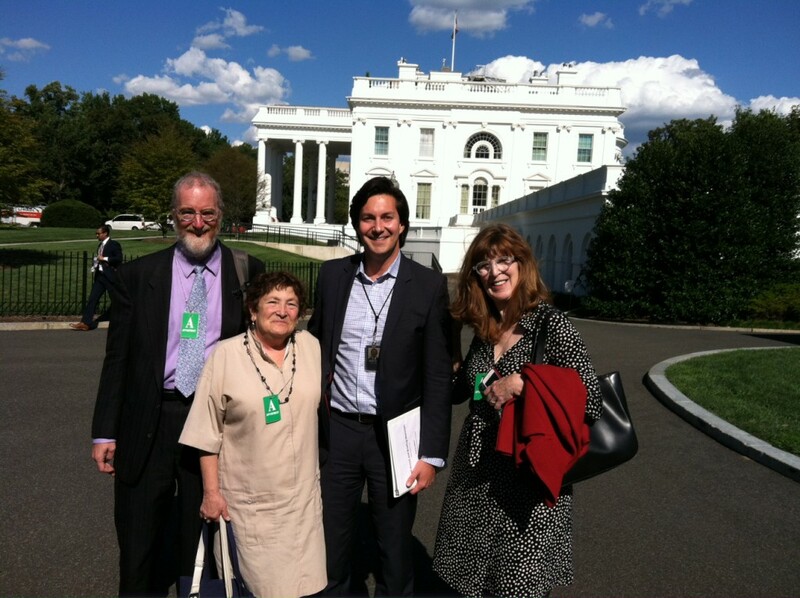 Representatives of the NWU, the Science Fiction & Fantasy Writers of America (SFWA) and the American Society of Journalists and Authors (ASJA) met in mid-August with key Congressional and White House staff responsible for copyright policy. The delegation of writers included NWU’s Edward Hasbrouck, book division co-chair, and Ann Hoffman, former 1st VP; SFWA’s past president Michael Capobianco; and ASJA’s advocacy director Salley Shannon. We brought to Washington our common concerns about our ability to get our fair share of the revenues from new digital writing platforms. If you have a story to tell about how you’re earning money from your writing in a “non-traditional” way, or you want to be involved in this important project, please send a note to nwu@nwu.org. Our three organizations of working writers have often come together in recent years as allies in the face of threats to our livelihoods, including theft of our digital rights by print publishers; unauthorized mass digitization (book and periodical scanning); and other digital bootlegging. We fight against new laws and legal interpretations that deem much of our work “orphaned,” and allow others to copy it without our permission or payment. On Capitol Hill, we met with the chief Republican and Democratic counsel for the House judiciary subcommittee on Courts, Intellectual Property, and the Internet. That body recently concluded a two-year series of hearings on possible “reform” of the US Copyright Act. We were pleased to be invited by subcommittee’s staff to give our feedback on the hearings, and to review our priorities for changes to copyright law. We began by pointing out the need for greater understanding of writers’ new business models in the digital age, an understanding that can only come from consulting and listening to working writers. To make our case more persuasive, the Congressional staffers encouraged us to provide more details about our digital business models. They were especially interested in specific examples of ways that our members earn money from new digital uses of our works, including works previously published in traditional formats. This is likely to be a part of the research and reporting project on the state of the publishing industry, and writers’ roles in it, as approved by the NWU Delegate Assembly in August. Writers work independently, and most aren’t members of unions or other organizations that represent our economic interests, we explained. Our colleagues don’t have professional lobbyists or permanent offices and staff in Washington. For those writers who do belong to unions, most of the work is done by member volunteers, such as our delegation’s trip to Congress and the White House. We noted that few, if any, of the proposals made during the hearings on copyright law came from or would benefit working writers. We stressed that publishers don’t speak for us. In the context of copyright law, publishers and writers are often conflated under the single term “rightsholders,” despite our opposing interests. Working writers are the entrepreneurial small-business segment of the creative industries, we impressed upon them, and have been in the forefront of new digital publishing and distribution systems—far ahead of traditional publishers or other large and less agile institutions. Congress should work with writers to make sure that copyright “reform” doesn’t stifle innovations that benefit both readers and writers, even if those innovations threaten publishers and other intermediaries. We were pleased to be invited to this meeting and recognized as significant organizations with a stake in copyright legislation. We hope to be able to follow up with a briefing for more Congressional staff about how writers earn in the digital age, as members of Congress consider what copyright legislation to introduce or support in the months ahead. We will need more details and examples of how members are digitizing their former print work and exploiting self-publishing, digital publishing, and other newer revenue streams in order to make our point persuasively to Congress. 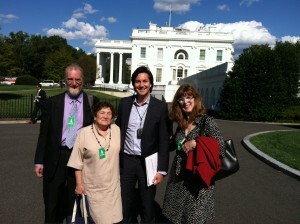 Later, we met with the White House Intellectual Property Enforcement Coordinator (IPEC), Danny Marti. He’s the President’s chief advisor on copyright enforcement policy, and was appointed earlier this year. We updated him on developments since our meeting with his predecessor in 2011. We told him that writers have little ability to enforce our copyrights, and continue to face unfair competition from those who infringe upon our work. Digital infringers aren’t limited to the usual suspects of “pirate” websites, but include print publishers who release digital editions of works to which they hold only print rights, or no longer hold any rights at all. Marti seemed to understand our concerns, and encouraged us to come back to him with more detailed evidence of the problems we described. He described his own background as a published poet and recipient of a poetry fellowship before he decided that law offered better income prospects than writing poetry. Who could argue with that!